The Manitoba Centennial Trophy was presented to the Canadian Amateur Hockey Association (CAHA) by the Manitoba Amateur Hockey Association to commemorate their centennial year of 1970. It was in that year that the CAHA reconfigured their junior tier, creating two separate classifications - Major Junior and Junior "A." The Major Junior class encompassed the teams that made up the "Canadian Major Junior Hockey League" while the Junior "A" section included the remaining junior teams within the association. 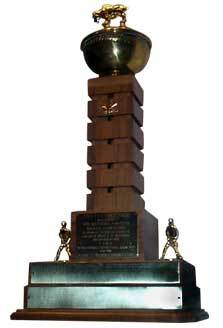 With the Memorial Cup established as a trophy exclusively for teams in the "Canadian Major Junior Hockey League", the Manitoba Centennial Trophy served as the trophy for the champions of this new Junior "A" division. In 1996, the Canadian Hockey Association introduced the newly named Royal Bank Cup for teams in the "Canadian Junior A Hockey League."